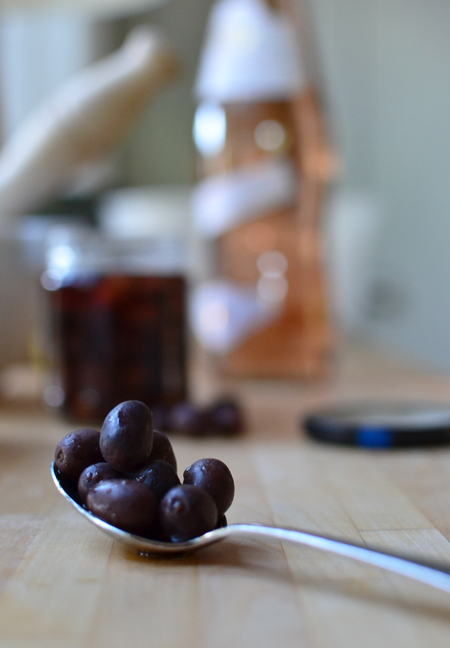 Who writes a food blog post before they have even tasted the food, much less before ever making it? I am on a plane headed to the Pacific Northwest, going to a professional conference. I packed all the mundane needs for such a trip: flash drive with my PowerPoint, notes for my presentation, clothes, Dopp kit, and eyeglasses. At the last minute, I added my unopened June issue of Food & Wine. An aside: My rule of thumb regarding the value of any single issue of a magazine is this: if there is even one recipe that has me salivating, counting the hours till I can make it, the issue is worth having. It's even better if that dish comes out well, and is something I will make again and again. After opening my magazine on the plane, I knew immediately what I will be making for my August 1st post... and it's only May 17! My mind is racing ahead to a hot July afternoon. The temperature will probably be somewhere around 100°F. Maybe even 110°F. We will want a break from the relentless summer heat, even though we don't mind it terribly. I will pack a picnic. We'll invite some friends to join us. We may drive up 8000 feet to the forested mountain north of Tucson, or south to the cool upland prairie. I can envision a crisp, chilled rosé. And I will make these sandwiches. 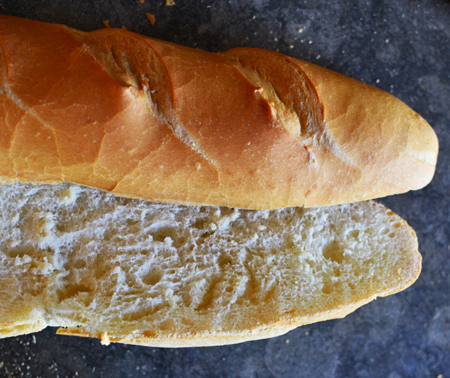 Pan bagnat, a Provençal specialty. I will make changes in the magazine’s version of the recipe to suit our tastes. 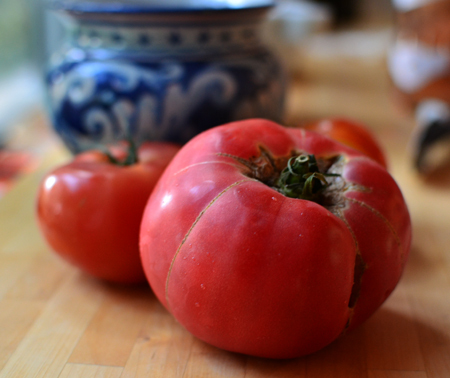 I will wrap them in parchment and tie them with twine. And, by the time we arrive at our cooler destination, under the shade of a coniferous mountain forest or Arizona live-oak tree among shimmering prairies, the ingredients will have spent the perfect amount of time marinating. The flavors will come together and become one, yet each bite will have something special that will shine through. 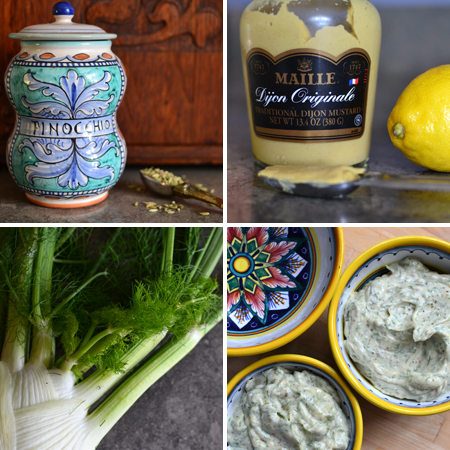 A burst of capers, fennel, tuna, or anchovy. But all as one. 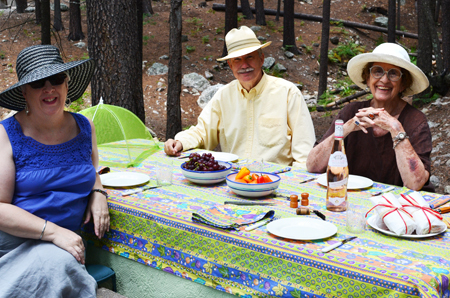 Barbara, Mark, and Dianne - my perfect picnic companions! 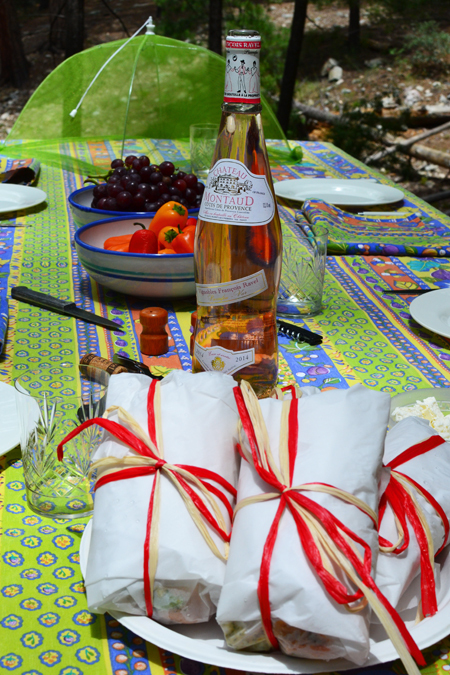 This is the perfect meal for a rosé, and I invite you to see which one I paired with this sandwich on this week's issue of the Provence WineZine. On July 25th, two months and a week after writing the post above, I made the pan bagnat and they were everything I had hoped for. Mark, Barbara, Dianne, and I went up Mount Lemmon, and picnicked in the cool mountain air under a canopy of tall pine trees. We had one special visitor while eating; he was sad that we refused to share. But he was brazen enough to check the box from Café Français, where I got the cookies and bread. Start by making the mayonnaise. Lightly toast the fennel seeds in a dry skillet over medium-low eat until golden. Let cool, then grind in a spice grinder. Place egg, 2 teaspoons lemon zest, 2 teaspoons lemon juice, fennel fronds, mustard, salt, pepper, ground fennel, and 3 tablespoons olive oil in the bowl of a food processor fitted with the steel blade. Purée for 10-15 seconds, or until fennel fronds are finely chopped. Then, in a VERY slow and steady stream, with processor running, add the light oil. By the time it is gone, the mixture should be a perfect mayonnaise. Place 3/4 cup of the mayonnaise (reserve the rest for another use, like steamed artichokes), the crème fraîche, and Pastis in a medium bowl. Mix well and taste for seasoning; add salt and pepper if needed. Refrigerate until ready to use. Next, in another medium bowl, mix roasted red pepper, olives, capers, Piment d'Esplette, and remaining lemon zest and juice. Flake in the tuna and remaining 2 tablespoons olive oil. Set aside to marinate for at least 30 minutes. 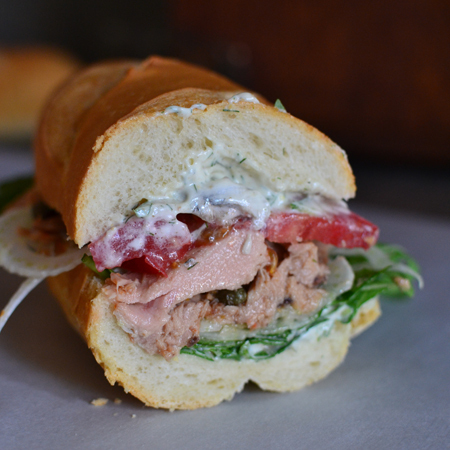 To make the sandwiches, generously spread both cut sides of the baguette with the fennel mayonnaise. 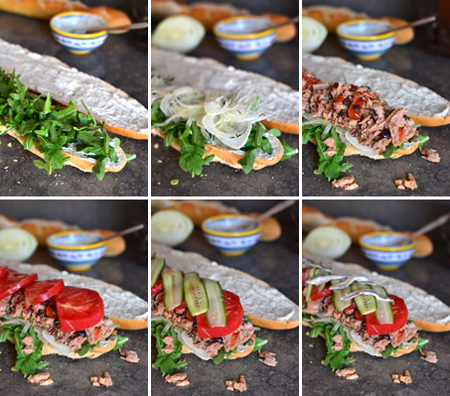 Arrange the arugula on the bottom half of the baguette. Top with sliced fennel, then the tuna mixture. Top with sliced tomatoes, cucumbers, and white anchovies. Place the other half of the bread on top, then slice into four sandwiches. 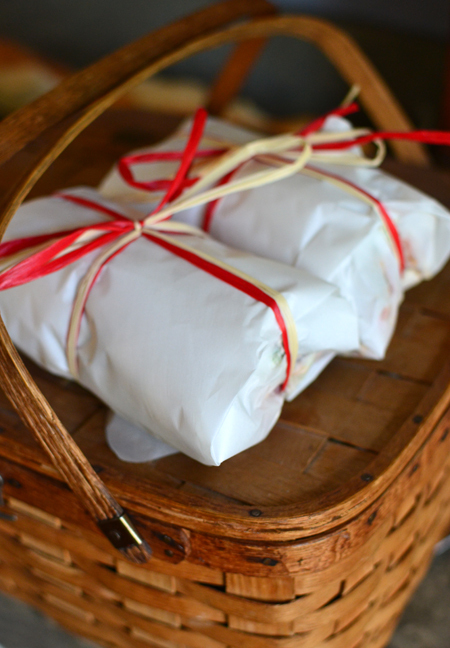 Wrap each individually in parchment and tie with twine. Keep on ice in a cooler for a couple of hours while you travel to your picnic site. 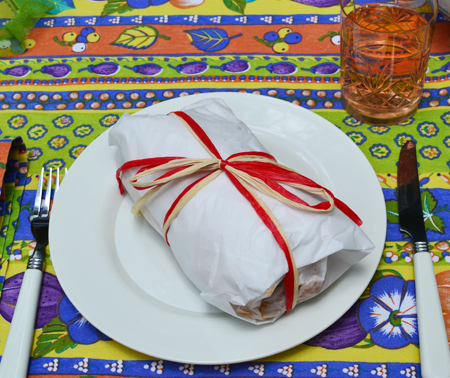 Unwrap, and grab a taste of summer heaven. Don't forget to bring plenty of napkins - this is a messy sandwich! PS I head up to the Pacific Northwest for 3 weeks starting Aug 3! I hope you left me some good food. Oh, Greg - I can only imagine the mess I would make of myself at the Hollywood Bowl if I tried to eat a Pan Bagnat there! You must be a much tidier picnicker than I! Have fun in the PNW! I wish I did, too, Mimi! Maybe we will get to visit one day! Thanks for your kind comments! Hi David, you know I have been to Tucson numerous times but never to Mount Lemon, on the to do list. 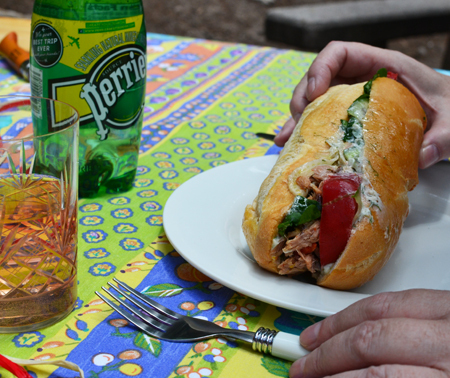 Looks like a wonderful picnic and your Pan Bagnat looks mouthwatering. Thanks, Cheri! Yu really must come down when you return from the PNW and we will take a picnic up - the views are breathtaking! Thanks, Liz! Hope you are settling back in, and that the jet lag isn't horrible! I love food magazines, and there does always seem to be that one inspirational recipe to try. This looks soooo delicious! I love it! I find I am getting fewer magazines these days, opting to get only my favorites so I can try more from them. F&W and Saveur are my two mainstays! David - What a fabulous post! I love all the elements (yummy food, fabulous Rosé wine, good friends, beautiful scenery) but especially how it all came together. Your unexpected guest is quite cute, too. Thank you for sharing! Thanks, Nicole! It was nice to get a chance to do some photos outdoors - and nature provided a great setting and several little furry friends! Oh I love the story you told in the post! And it's so true about valuing magazines based on the recipes published in them. I do it too. I have storage boxes filled with old magazines, and I know exactly what recipe I like to use is in each issue! Enjoyed this post! You are much more organized than I am, Marcelle! I usually know which magazine a recipe came from, but where I put it is anyone's guess! Anything that inspires you to drop the mag, run off to start something new is well worth a pretty penny. 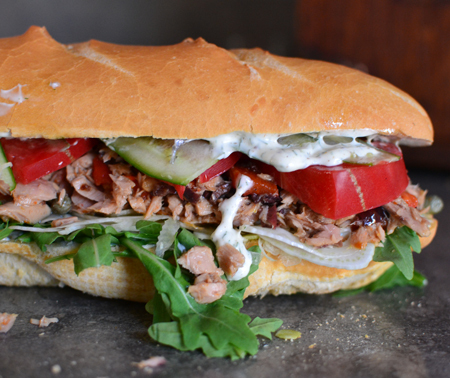 This is one hell of a tuna sandwhich. So hearty and full of flavour. I can't wait to taste it. Thanks, Colette! I can't wait for our next picnic! That's one serious sandwich, and loaded with some of my favourite things! Especially anchovies. Mount Lemon looks like such a beautiful area to visit. I think I need to add that to my list of places to see when we head through your area on our next big trip! John - the mountain is an hour from our house - it will be easy to visit when you are staying with us! Sounds like you had an absolutely perfect picnic! And the food looks fabulous, a far cry from the tuna sandwiches (canned tuna with egg and mayo) I grew up eating. My girls have never had a tuna sandwich because I am not keen on shelf stable meat products, but you certainly have done an excellent job in promoting jarred tuna. I just may have to give this a try. Nicely done! I like taking my food magazines on business trips and rip out the pages with recipes I want to try and recycle the rest of the magazine. I'm impressed that you actually made one of those recipes - mine tend to just sit on a top shelf of a kitchen cabinet. I use very few canned or jarred products, but this tuna is one of them. It really is so good. 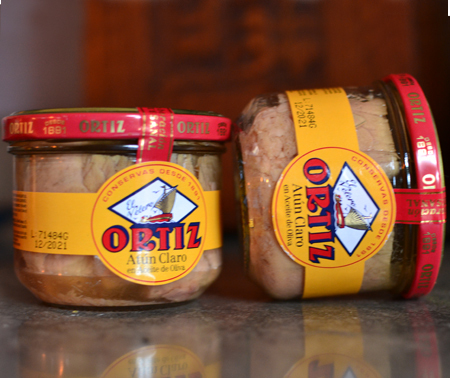 I am going to work onajing my own preserved tuna and freezing it! 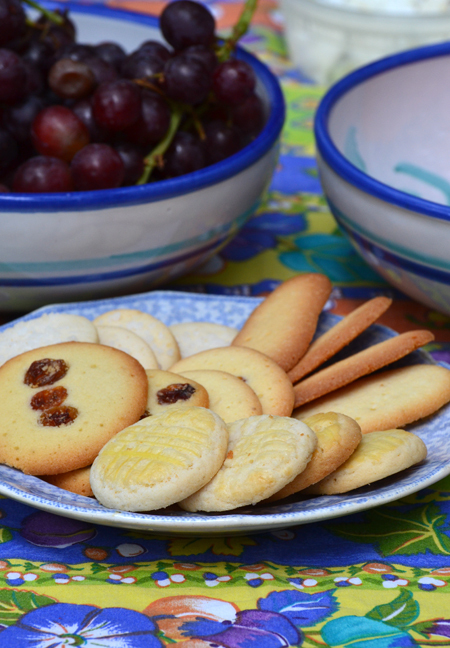 You really could be in Provence! I've been learning to love Provence Roses. I don't envy your heat, but I do envy your picnic! And, I love your uninvited guest! 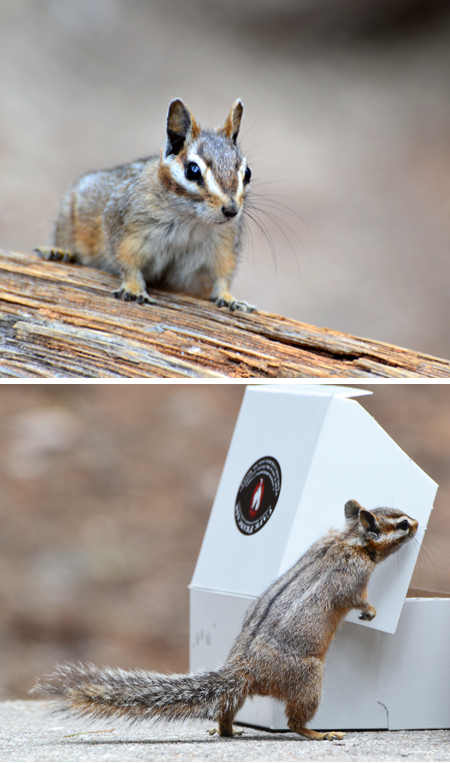 Our little guest was definitely cute - and quite bold! I am finally responding to this gorgeous post. It read like a real page turner! (I wonder what the equivalent phrase will be for digital media.) it looks delicious and the wine you had with it sounds wonderful! Thanks, Inger - yes, he was a cute (and brazen) little guy! Thanks, Laura - you are the only one who has admitted to the "write before you make" issue! But, sometimes, you just know it is going to work, right?